The Tharparkar a Bos indicus breed used for milk production and as draft animals. Tharparkar are of the lyrehorned type of zebu cattle. The Tharparkar came into prominence during the first World War when some animals were taken to supply milk for the Near East army camps. Here their capacity for production under rigorous feeding and unfavorable environmental conditions at once became apparent. Since then many breeding herds have been assembled in India and Pakistan. When left on arid pasture the milk production is approximately 1135 kg per lactation, while those animals maintained in the villages average 1980 kg. In India and abroad, these cattle are known as Tharparkar since they come from the district of that name in the Province of Sind. The Tharparkar is, however, known differently in its own region. In its native tract and the areas neighboring on it, the breed is called Thari, after the desert of Thar; and it is also occasionally known as Cutchi, because the breed is also found on the borders of Cutch which adjoins Tharparkar to the south. 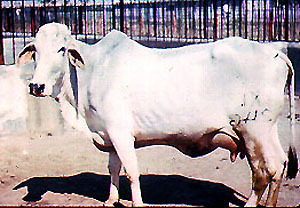 Then again, in the past these cattle have been known as White or Gray Sindhi, since they are native to the Province of Sind and similar in size the Red Sindhi: this name, however, is no longer used. The Thari is not a homogeneous breed, but that it has the influence of the Kankrej, Red Sindhi, Gir and Nagori breeds. It is observed that the typical Thari cattle are found in the areas in the vicinity of Umarkot, Naukot, Dhoro Naro, Chhor, Mithi, Islamkot and Khari Ghulam Shah. They are also produced in the adjoining Indian States of Jodhpur, Jaisalmer and Cutch. Tharparkars are usually kept in herds of 50 to 300 animals by professional breeders called Maldars. They require daily contact with people to prevent them from becoming shy and wild. Tharparkar cows average 138 cm in height and an average weight of 408 kg. Average animals of the Tharparkar breed are deep, strongly built, medium-sized, with straight limbs and good feet, and with an alert and springy carriage. As the animals are not handled frequently they are apt to be wild and vicious. The usual color of the cattle is white or gray. In males, the gray color may deepen, particularly on the fore and hind quarters. All along the backbone there is a light gray stripe. The color of the cattle deepens during the winter months and also when the cows are pregnant. In the Thari tract, in addition to white and gray coat color, black and red or combinations thereof are usually encountered on account of the influence of the Red Sindhi and Gir. The head is of medium size, the forehead broad and flat or slightly convex above eyes: the front of the horns and face are practically on one plane. The skin between the eyes is often wrinkled, the wrinkles running perpendicularly. The eyes are full and bright. The eyelashes are black and there is a small ring of black on the eyelids. The ears are somewhat long, broad and semi-pendulous and face forwards. Horns are set well apart curving gradually upwards and outwards in the same line as that of the poll with blunt points inclined inwards. A small portion of the skin with hairs extends over the base of the horns. In the males the horns are thicker, shorter and straighter than in the females. The hump in males is moderately well developed, firm and placed in front of the withers. The dewlap is of medium size and the skin is fine and mellow. The sheath in the males is of moderate length, and is semi-pendulous. The navel flap in the females is prominent. The size is variable. Shoulders are light and legs are comparatively short, but in good proportion to the body. The hooves are hard and black, of moderate size and have no tendency to turn out. The color of the skin is black, except on the udder, under the belly, on the lower part of the dewlap and inside the ears where it is rich yellow. The hair is fine, short and straight, but in the male it is slightly curly on the forehead. Thari cattle are said to be very hardy and resistant to several tropical diseases but definite date is lacking. Although animals of the breed are excellent foragers and can stand the rigors of climatic and environmental conditions, they have not been used primarily as a source of meat, and breeders have given little attention to meat qualities.